Summary from Goodreads: Eighteen-year-old Buddy McNeal has always finished last in the eyes of his parents. His mother deserted the family, divorcing his dad when Buddy was eleven. Buddy’s father, a wealthy real estate investor, is a big-time womanizer who no longer has time for him. As an all-state wide receiver, Buddy earns a college football scholarship and intends to prove to himself and his parents that he is somebody by becoming an all-America player in college, and eventually a million-dollar star in pro-football—recognized, admired, and loved by everyone. In ninth grade, Buddy had a brief sexual encounter with the beautiful but mysterious Crystal Crowe, who promptly disappeared, only to return as a senior. They meet up again, and Buddy falls in love with her, but he quickly becomes embroiled in her unstable home life, including a lesbian love triangle. He follows Crystal down a path that leads them both into a horrific world of mayhem, and eventually murder: Buddy’s dreams for the future destroyed, his life forever changed. 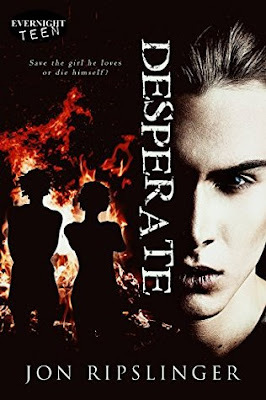 Review: Desperate is a twisted ride of murder and love. You can't help but feel for poor Buddy McNeal as he his sucked into this world of lies. All he ever wanted to do was make his father notice him, but that leads to wrong decisions. I really loved following Buddy's story. It was nail biting as I turned into one of those girls that says things like "Don't go in the basement!" I found myself wanting him to make the right decision, but also wanting him not to because I craved the drama and mystery. The story was a little short, leaving me a little disappointed. I think if there was more to the trial and ending it would have been better, but it still kept me entertained throughout the whole book.